Nearly 100 LLB and Diploma in Law graduates attended the Undergraduate Laws Programme graduation ceremony held at the Hilton Hotel in Trinidad last month. Senator the Hon Anand Ramlogan, Attorney General of Trinidad and Tobago, former West Indies cricket captain Daren Ganga and other local dignitaries were special guests at the ceremony, presided over by Professor Jonathan Kydd, Dean of the University of London International Programmes and Professor Jenny Hamilton, Director of the Undergraduate Laws Programme. I would like to commend the University of London for its commitment to higher education and for providing programmes which are tailored to the needs of its students. Without this opportunity many people, including myself, would not have been able to achieve their dream and for this I will always be grateful. I wish each and every one of you success wherever life’s path may lead. I would like to remind you that each one of us has been given the chance to accomplish great things in life and I urge you to not only strive for self enrichment but to also be selfless, to never forget why you embarked upon this career path in the first place. We all now have a wealth of opportunities at our fingertips, let us make the most of them and leave a lasting impression and contribution to society. The Undergraduate Laws Programme would like to thank all graduates, their guests and invited dignitaries for attending. We would also like to extend our thanks to the teaching institutions in Trinidad for their support, not only on our behalf but also on behalf of those graduates who have spent many hours in your classrooms over the years – Academy of Tertiary Studies, College of Legal Studies, Institute of Law and Academic Studies and K Beckles Associates and Law Tutors Limited. 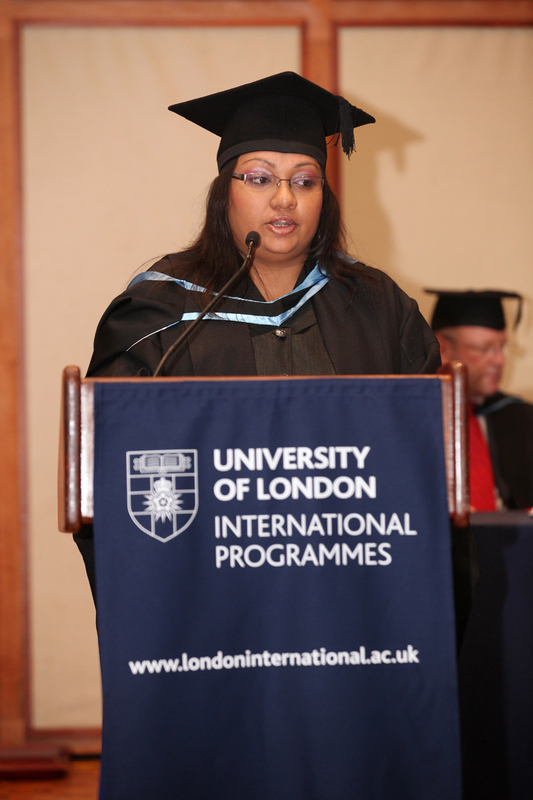 In addition to the Laws Graduation, the University of London International Programmes held a drop-in question and answer session for current students and a student recruitment fair for prospective distance learners. Thank you UoL. It was indeed a memorable occasion. I hope you can continue the graduation ceremony here in Trinidad or in other Caribbean countries in future because a lot of students here as well as other Caribbean countries who are unable to make the trip to London would have that opportunity just like myself.